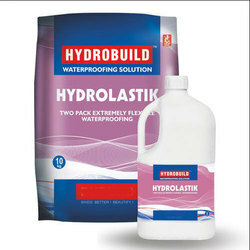 Offering you a complete choice of products which include waterproofing chemicals and curing compound. Owing to our expertise in this field, we are affianced in offering premium quality Waterproofing Chemicals. These chemicals are used in swimming pools, terraces and balconies. Furthermore, these chemicals are used in the construction of concrete, natural and artificial stone, traditional mortar plasters, bricks, concrete blocks. Under the observation of our team, these Waterproofing Chemicals are processed using high-quality chemical substances. Being a leading name in the industry, our main motto is to manufacture and supply a pure range of Curing Compound. Formulated at our state of the art machining facility by using quality compounds, these liquids are applied on the concrete surface to prevent concrete from premature drying and enable the process of hydration. Our Curing Compound is gaining appreciation both in the domestic as well as international market for its accurate composition, excellent adhesion and effectiveness. Furthermore, we offer these compounds in quality packaging at a nominal price.